Starting Monday, May 14, the North Dakota Department of Transportation (NDDOT) Fargo District and City of Fargo will begin one of the major arterial road improvement projects occurring this summer. 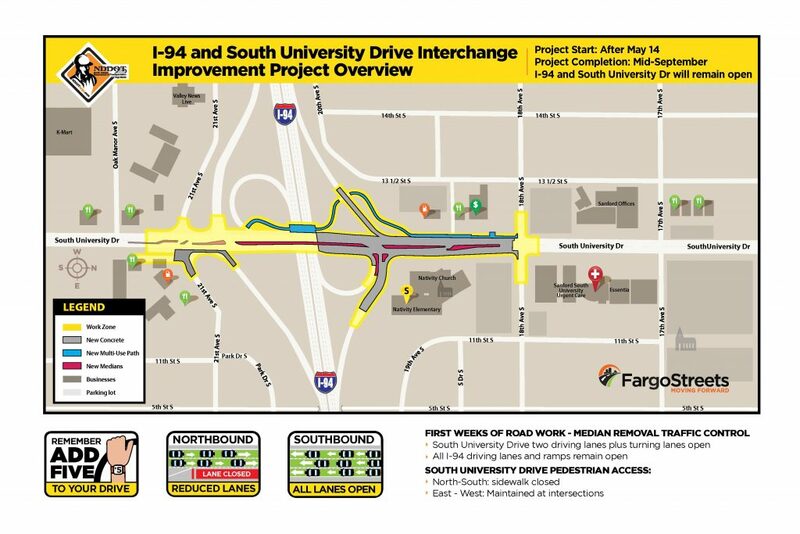 This project will completely reconstruct South University Drive between 18th Avenue S and the north side of the I-94 bridge as well as ramp and pedestrian improvements. Project work is slated to be complete in mid-September. Monday traffic impacts will start by 6 a.m. when contractors will reduce the driving lanes from six to four lanes on South University Drive. The westbound I-94 off-ramp will have a lane reduction as well. Crews will be removing the median near the I-94 bridge to 18th Avenue S during the first week of work. Overnight I-94 ramp closures will occur, 9 p.m. – 6 a.m. Posted detour will be via 25th Street S.
First phase: Remove curb and gutter and install temporary pavement in the median. Two lanes of traffic will be maintained in each direction. Second phase: Reconstruct east half of South University Drive while maintaining two lanes of traffic in each direction. There will be short periods when traffic is restricted to one lane in each direction. Third phase: Reconstruct west half of South University Drive while maintaining two lanes of traffic in each direction. There will be short periods when traffic is restricted to one lane in each direction. Fourth phase: Reconstruct the center median and build new cross-traffic center median. Two lanes of traffic will be maintained in each direction. Work on the south side of I-94 will be completed as resources allow and the pedestrian underpass will be built during multiple phases of the project. NDDOT is funding the project with majority of federal and state funds totaling $4.9 million. The City of Fargo is participating by funding the infrastructure improvements and storm sewer upgrades.